Fall is here so that means it is time for the semiannual United Thank Offering Ingathering. the United Thank Offering was founded to help individuals pay more attention to the spiritual blessings in their lives to support innovative ministries in the Church for which the church budget had not yet expanded to fund. It is still going strong today through grants that focus on meeting compelling human needs and to expand the mission and ministry of the church at home and throughout the world. Through these grants, those less fortunate can come to know the love of God. Since 1889, UTO has awarded 5,257 grants for a total of $137,094,171. Where does the money go? Every penny goes to grants and is given away the following year to support innovative mission and ministry throughout the Episcopal Church and Anglican Communion. For 2018, 34 grants plus ten Young Adult and Seminarian grants totaling $1,286,216 were awarded. Let’s give thanks for what we have in our lives and pass our many blessings onto others on Sunday, November 11th. 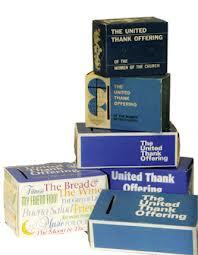 Please give generously to the United Thank Offering Fall Ingathering by using the envelopes in your pew. Even the smallest donations, when added together, can make a huge difference in the lives of others. Advent Retreat – What Child Is This?